Organogenesis of the kidney has been intensely studied for over a century. In recent years advances in molecular techniques have not only made great inroads into exploring the genetic regulation of this complex process but also began to unravel the molecular basis of many forms of congenital kidney disease. 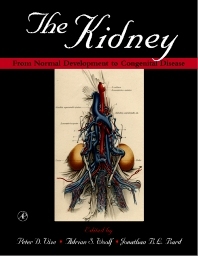 This book is a comprehensive study on these findings and the only book available with such in depth coverage of the kidney. Peter D. Vize uses the many advantages of model systems to explore the very first events in kidney development. These studies have characterized both the inductive signals that initiate kidney formation and also characterized the genetic response to these signals. University of Calgary, Canada and University of Texas, U.S.A.
Adrian Woolf heads the Nephro-Urology Unit at the Institute of Child Health. His research focuses on defining the biological basis of low numbers of glomeruli; on elucidating the normal mechanisms of renal vessel differentiation; vascular remodeling in kidney disease; and the study of the clinical and genetic aspects of primary vesicoureteric reflux, duplex kidneys, glomerulocystic diseases (oral-facial-digital type 1 and the Renal Cysts and Diabetes syndromes), Bardet-Biedl syndrome, Kallmann's syndrome etc.